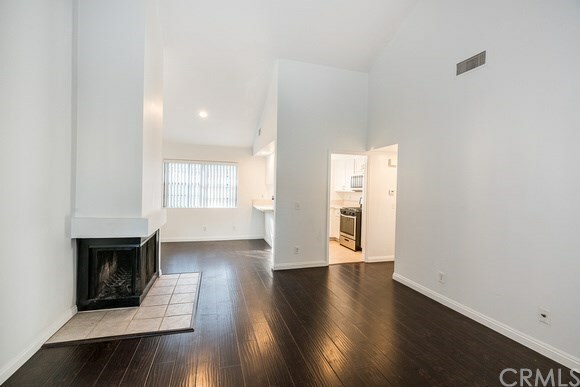 WONDERFUL OPPORTUNITY TO OWN A CHARMING 2 BEDROOM 2 BATH CONDO IN NORTH WEST SANTA ANA. THE LIVING ROOM/DINING ROOM FEATURES A COZY WOOD BURNING FIREPLACE PERFECT TO RELAX. IT HAS BEEN FRESHLY PAINTED, HAS CENTRAL AIR CONDITIONING, HAS NEW LAMINATED FLOORS, NEW GRANITE KITCHEN COUNTER TOP, NEW STOVE AND OVER THE RANGE MICROWAVE. MASTER BEDROOM AND BATHROOM ARE SPACIOUS! THE MASTER BATHROOM HAS NEW VANITIES AND NEW MIRRORS. HALLWAY BATHROOM HAS NEW VANITY, NEW MIRROR AND NEW TILE FLOOR. LAUNDRY HOOK UPS ARE LOCATED IN THE TWO CAR GARAGE. IT ALSO FEATURES A LOVELY PRIVATE PATIO. WALKING DISTANCE TO STORES. SANTA ANA COLLEGE AND THE OUTLETS IN ORANGE AND FREEWAYS ARE JUST MINUTES AWAY.